Newmont Goldcorp (NYSE:NEM)(TSX:NGT) and Canada’s Barrick Gold (TSX:ABX)(NYSE:GOLD), the No. 1 and 2 bullion producers, have cleared all the regulatory conditions to combine their operations in Nevada ahead of schedule. The U.S. Federal Trade Commission, said the companies, granted an early termination of the waiting period under the Hart-Scott-Rodino Act on April 19. The new business, yet to be named, will be owned 38.5% by Newmont Goldcorp and 61.5% by Barrick, which will also be the operator of what the partners say it’ll be the world’s largest gold producing complex. The “historic” business combination (as the duo called it) is expected to generate savings of $500 million a year within the first full five years. It includes Barrick’s Goldstrike, Cortez, Turquoise Ridge, and Goldrush and Newmont’s Carlin, Twin Creeks, Phoenix, Long Canyon, along with associated processing plants and infrastructure of both companies. Excluded from the joint-venture, for now, are Barrick’s Fourmile project and Newmont’s Fiberline and Mike deposits. It also does not include Newmont’s Cripple Creek & Victor mine. The agreement follows Newmont’s rejection of Barrick’s $18 billion hostile bid last week, countering with a proposal for a JV with a 55% interest for Barrick. Newmont’s contra-offer wasn’t immediately welcome by the Toronto-based miner, which wanted a higher percentage and control of the venture. After exchanging quite a few mutual verbal offences, the chief executives of the long-time rival miners reached a consensus over dinner in New York last month. Practical measures required to integrate the joint venture assets and establish the new business are now being taken, the partners said, and they are anticipated to be complete within the current quarter. The post Barrick, Newmont joint venture in Nevada clears all hurdles appeared first on MINING.com. The main satellite deposit is called Sona Hill. It contains 11.7 million measured and indicated tonnes grading 1.04 grams gold per tonne for 394,000 oz. gold and 11.6 million inferred tonnes at 0.95 gram gold for 356,000 oz. gold. The project’s resource is split between three proposed open pits — Toroparu, SE Zone and Sona Hill — with most of the tonnage and contained gold at the main Toroparu pit. In total, the project has 252.5 million measured and indicated tonnes grading 0.91 gram gold for 7.35 million oz. gold, and 128.9 million inferred tonnes at 0.76 gram gold for 3.15 million oz. gold. It also has 240.7 million measured and indicated tonnes at 0.81 gram silver and 0.08% copper for 6.28 million oz. silver and 444 million lb. copper, as well as 117.3 million inferred tonnes at 0.07 gram silver and 0.04% copper for 276,000 oz. silver and 104 million lb. copper. Sona Hill contains no copper or silver. Sandspring plans to mine Sona Hill along with the Toroparu main pit and SE Zone simultaneously, opening up some of the higher-grade, gold-only zones around the main pit before starting an expansion phase in year five. The run-of-river hydro project would net Sandspring US$500 million in power savings over the mine life. It signed a memorandum of understanding with the Guyanese government in 2013 that gives the company the exclusive right to develop the project. The Kurupung river project would be located 50 km southwest of Toroparu and cost $120 million to $130 million to build. It would lower the company’s cash cost from US$700 per oz. gold in the PFS to US$565 per oz. gold. Combined with the Wheaton investment, it would lower Sandspring’s all-in sustaining costs from US$922 per oz. gold to less than US$800 per oz. gold. “That run-of-river of course would replace diesel, which we would otherwise be burning for the entire life of the project,” Munson says. “It brings a really interesting green dimension. The company would still rely on diesel as back-up power. Last year, Gran Colombia Gold (TSX: GCM) bought 14.78% of Sandspring, with warrants that could increase its ownership to 20.83%. It holds 18% of the company. As part of its deal, it also picked up Gran Colombia’s Chicharron silver project in Colombia. The company looks to put Chicharron into production soon. The project is located 4.4 km east of Gran Colombia’s Maria Dama processing facility. Gran Colombia confirmed high-grade silver mineralization at the project’s Guia Antigua mine in its 2017–2018 exploration program. Guias Gold operated the mine from 2014–2016 reporting average grades of 466 grams silver and 7.44 grams gold. It produced 78,500 oz. silver and 1,170 oz. gold from 6,000 tonnes grading 404.9 grams silver and 6.05 grams gold. The company mined 12 tonnes per day using non-mechanized methods. It primarily mined a 1- to 3-metre-wide quartz vein, with minor carbonate. Sandspring acquired the project in 2018 for 36 million shares and US$1 million in cash. It recently finished an eight-hole drill program at Chicharron to determine where the vein is offset, and which direction it’s going. Sandspring shares are trading at 24¢ in a 52-week range of 17¢ to 35¢. The company has a $49-million market capitalization. “In what I call the days of wine and roses back in late 2013, we had a $400-million market cap, and we were trading at $4 a share,” Munson says. “Today we’re 25¢, and I still own the same shares I got in 2009. This story by Richard Quarisa first appeared on www.northernminer.com. The post Sandspring rethinks Toroparu in Guyana appeared first on MINING.com. That crisis is in the offing because large gold companies (the report analyses the 20 largest gold miners) have cut exploration budgets by 70% since the go-go years, McKinsey says. At the same time, major greenfield discoveries have become ever more elusive. This has resulted in reserves at the majors declining by 26%, or 254 million ounces since 2012, to the lowest level since 2007. McKinsey answers the report's central question and calls for organic strategies including exploration innovation, advanced analytics and new technology including the internet of things (IoT) and blockchain. That may not be so easy, given the industry’s track record. In the decade leading up to the 2011’s gold price peak above $1,900 an ounce, the industry saw over 1,000 acquisitions with a combined price tag of $121 billion (2011 alone saw $38 billion worth of deals done) at premiums of 30% or more. As the chart shows were it not for M&A activity these companies’ gold reserves would have stayed flat. The belief in the industry clearly was that gold could only go up – the average price paid per ounce reserve in this peak period was often more than 300% higher than deals executed a decade earlier, says McKinsey. A full 80% of the transaction value of the eight largest deals between 2001 and 2011 has been impaired. Combine that with the industry-wide downturn in metal prices and you get this eye-watering chart. The large gold mining companies have been mending fences with investors, McKinsey points out, by cutting capital expenditure and slashing costs. Weighted average all-in sustaining costs were reduced by 21% to $879 an ounce between 2012 and 2017. The 20 largest gold companies spent $12 billion on new projects in 2016, $18 billion less than in 2012 when the gold price was suffering the first of a series of anni horribilis. Whether skittish gold sector investors will allow these companies to ratchet up spending again is the proverbial $129 billion question. The post These charts are a big reality check for gold mining stock bulls appeared first on MINING.com. Canarc Resources (TSX: CCM) has wrapped up a preliminary economic assessment of its New Polaris gold project in northwestern British Columbia that indicates the project could produce 80,000 ounces of gold per year over an 8.7 year mine life. By market close the Vancouver-based junior's stock had jumped 20%. The study assigns New Polaris a $216 million after-tax net present value at a 5% discount rate and a 38% after-tax internal rate of return. It would cost $111 million to build and process 750 tonnes per day at a 90.5% recovery rate to achieve after-tax payback in 2.7 years. The study eliminates the need to ship concentrate along the Taku River to a third party treatment facility, which the company had contemplated in past studies on the project. It would instead use bio-oxidation followed by a leaching process to produce doré bars at site. Canarc initially explored the project’s C vein system between 1988 and 1997, infill drilling it between 2003 and 2006. The current resource consists of over 170 holes. The project contains 1.68 million indicated tonnes grading 10.8 grams gold per tonne for 586,000 oz. gold. The project also contains 1.48 million inferred tonnes at 10.2 grams gold for 485,000 oz. gold. The company is considering a feasibility work program at New Polaris that would include 24,000 metres of infill drilling and cost about C$10 million. The post Canarc's stock jumps on PEA at New Polaris appeared first on MINING.com. 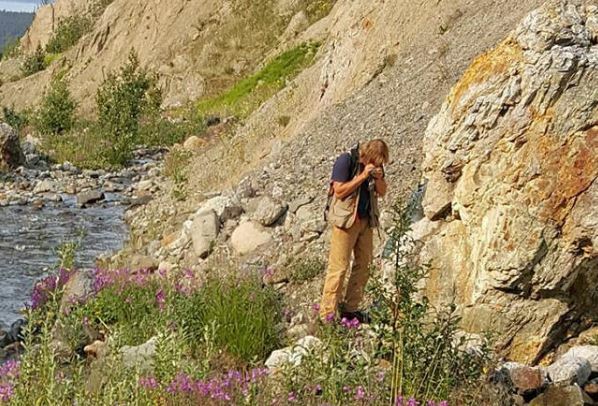 A Brixton geologist examines a rock sample at the Atlin Project in northwest British Columbia. Source: Brixton Metals Corp.
Brixton Metals Corp. [BBB-TSXV; BXTMF-OTC] said Thursday April 18 that it has started exploration work at its wholly-owned Atlin goldfields project near the town of Atlin in northwestern British Columbia, and within the traditional territory of the Taku River Tlingit First Nation. Since 2016 Brixton has consolidated approximately 1,000 km2 of mineral claims, covering most of the Atlin gold camp, which has been a venue for placer gold production for the past 120 years. Brixton’s goal is to discovery the bedrock sources for the gold mineralization using modern systematic exploration techniques. Brixton is a precious metal exploration and development company with a focus on advancing its wholly-owned projects towards mine development. Its shareholder group includes Bay Street financier Rob McEwen, Pan American Silver Corp. [PAAS-TSX, NASDAQ], and Hecla Mining [HL-NYSE]. On Friday, the shares eased 3.45% or $0.005 to 14 cents. The 52-week range is 13 cents and 24 cents. The company was in the news last year when it tabled initial drill results that the company said confirm the presence of high cobalt and low silver veins on its wholly-owned Hudson Bay Project, which is located near Cobalt in northeastern Ontario. Hudson Bay is part of what is known as the Langis-Hudson Bay silver-cobalt project. It was a high-grade silver mine with cobalt produced as a by-product. Hudson Bay is located near the Langis Mine, which produced over 10.4 million ounces of silver and 358,340 pounds of cobalt. The Atlin gold project is an early stage gold exploration play in search of Barkerville-style or California-style mother-lode gold deposits, the company has said. It covers 979 km2. The Atlin camp is the second largest gold producer in British Columbia on record, with a reported placer gold production of over 600,000 ounces between 1898 and 1946 from creeks in the area. It also holds the provincial record for the largest nugget, weighing 2.6 kilograms. Several of the creeks crossing Brixton’s claims have seen historic placer production of up to 44,109 ounces on McKee Creek. In 1988, Homestake Mineral Development Co. outlined the Yellowjacket gold zone by drilling 58 diamond drill holes, intersecting gold to a depth of 140 metres. More recently, samples taken by Brixton from the LD showing in 2017 returned a high of 293 g/t gold. By comparison, historical drilling in the Yellowjacket Zone returned up to 5.57 metres of 509.96 g/t gold. On Thursday, Brixton said construction has begun on a new 35-person exploration camp located at the Yellowjacket Mine (a permitted 200-tonne-per-day mine and mill currently on care and maintenance). The mine is road accessible and located 9 km from the town of Atlin. The company said exploration work planned for this year includes 3,000 metres of core drilling across four targets, including LD and Yellowjacket. The other two targets are Pictou and Imperial. Diamond drilling is expected to commence in late June. At LD and Pictou, a series of short drill holes will be utilized to test for vein continuity below historic trenches and to partially test gold-in-soil anomalies generated by Brixton in 2018. The LD showing is approximately 12 km from Atlin and is road accessible. The Pictou showing, located 2 km from Atlin, is also road accessible. Historic records dating back to 1899 reveal the discovery of gold-bearing quartz veins through 29 metres of underground workings. Chip sampling of outcrop in the vicinity of the adit returned 11.75 g/t gold and 4.48 g/t gold last year. I chatted with Craig Hemke today about the overall set up of the precious metals and the underlying stocks. We start with the Comex contracts and a stat that Craig shared on Twitter last night. Silver contracts on the Comex are now above 50% of the total gold contracts. This is an anomaly as usually there are more than double the amount of gold contracts. We also touch on the selloff in the gold and silver mining shares when the metal prices have been stable. The offering was underwritten by a syndicate co-led by Haywood Security and Cantor Fitzgerald Canada. The underwriters have also been granted a 15% over-allotment of 3.7 million shares at the same price per share. RNC recently made a high grade discovery – the Father’s Day vein – at its 100% owned Beta Hunt gold mine in Western Australia. The company has completed a 40,000-metre drilling program and expects to use the results to update the resource estimate and mine plan in Q2 2019. The Beta Hunt underground mine began producing both nickel and gold in 2015. RNC has decided to curtail the nickel output and concentrate on gold. As of December 2017, the mine has 2.4 million tonnes of indicated resources grading 3.2 g/t gold and containing 239,000 oz. The inferred portion was 2.0 million at 3.2 g/t gold for 208,000 oz. of contained gold. The post RNC Minerals closes C$12m bought deal financing appeared first on MINING.com. Roxgold (TSE: ROXG) announced Thursday that the deal to acquire from Newcrest a portfolio of 11 exploration permits in Côte d'Ivoire, including the Séguéla gold project, has completed. The Canadian miner paid $20 million upfront, to be followed by a $10 million deferred payment due when Séguéla reaches production. Séguéla is Roxgold’s second major project after the Yaramoko gold mine in Burkina Faso, also in West Africa. Séguéla is located approximately 240 kilometres north-west of Yamoussoukro, the political capital of Côte d’Ivoire, and approximately 480 kilometres north-west of Abidjan, the commercial capital of the country. “The Séguéla gold project provides a second key asset with significant growth potential both in the near term through the near-surface Antenna deposit and attractive satellite opportunities as well as a highly prospective large land package,” John Dorward, Roxgold's President and CEO said in a statement. The Antenna deposit hosts an inferred resource of 5.8 million tonnes at an average of 2.3 grams per tonne of gold, in addition to other satellite opportunities. Drilling is set to begin April 24 on multiple exploration targets, the miner said. 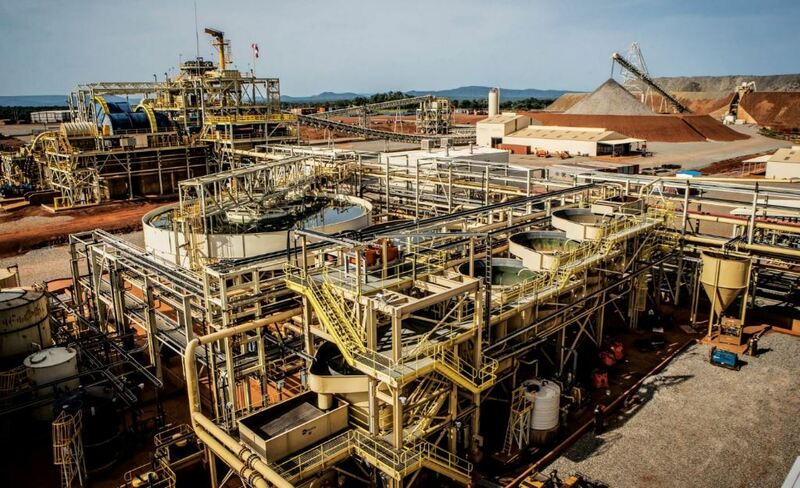 The post Roxgold and Newcrest close deal on Séguéla project in Côte d’Ivoire appeared first on MINING.com. B2Gold’s Fekola mine in Mali, West Africa. Source: B2Gold Corp.
B2Gold Corp. [BTO-TSX; BTG-NYSE] is off to a good start in 2019 after posting better than expected production in the first quarter. First quarter gold production of 230,859 was 6% above budget and driven by strong results from the company’s Fekola mine in Mali, West Africa. Consolidated gold revenue in the first quarter was $302 million on sales of 232,076 ounces at an average price of US$1,300 per ounce, compared to $344 million on sales of 259,837 ounces at an average price of US$1,325 an ounce in the equivalent 2018 quarter. Based in Vancouver, B2Gold is a senior gold producer with five operating mines and numerous exploration and development projects in various countries, including Nicaragua, the Philippines, Namibia, Mali, Burkina Faso, Colombia and Finland. Its roster of producing mines includes the Fekola mine in Mali, West Africa, the Masbate mine in the Philippines, and the Otjikoto mine in Namibia. The company also has two mines in Nicaragua – La Libertad and El Limon. The company has been widely tipped as a takeover target in the wake of news that Goldcorp Inc. [G-TSX; GG-NYSE] and Newmont Mining Corp. [NEM-NYSE] have agreed to merge in an all-stock deal worth $10 billion that will make the two companies the world’s leading gold producer. Meanwhile, B2Gold said the company’s Fekola, Masbate, Otjikoto and El Limon mines all exceeded their production targets. For example in the first quarter, Fekola produced 110,349 ounces of gold. Masbate produced 57,481 ounces. On March 26, 2019, the company announced positive results from the expansion study preliminary economic assessment (PEA) for the Fekola Mine, including an estimated increases in average annual gold production to over 550,000 ounces per year during the five-year period between 2020-2024. By comparison, Fekola is expected to produce between 420,000 and 430,000 ounces this year, making it the company’s biggest gold producer by a wide margin. Masbate ranks second with forecast production of 200,000 to 210,000 ounces in 2019. The company is also proceeding with an expansion project to increase Fekola’s processing throughput by 1.5 million tonnes annually to 7.5 million tonnes from the current base rate of 6.0 million tonnes. For the full-year 2019, B2Gold said it remains well positioned for continued strong operational and financial performance with consolidated gold production forecast to be in the range of 935,000 and 975,000 ounces. All-in sustaining costs are forecast at US$835 and US875/oz. On Friday, B2Gold shares eased 0.55% or $0.02 to $3.61 on volume of over 2.0 million. The shares trade in a 52-week range of $2.77 and $4.40. Also, in the second quarter of 2019, the company expects to complete an updated PEA for the 49%-owned Gramalote Project in Colombia. If the PEA is positive, the company and joint venture partner AngloGold Ashanti will consider whether to proceed to a final feasibility study. Gramalote is a gold development project located approximately 230 kilometres northwest of Bogota.